You really can't plan views like this. You can only plan a route and hope you'll get lucky. 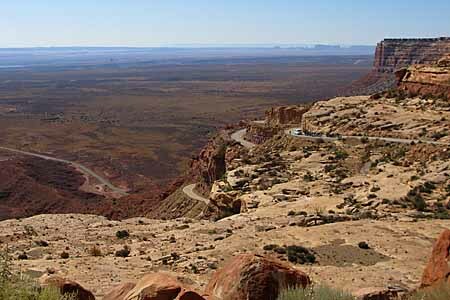 But you do have to get off the beaten path... (Taken from the Moki Dugway, looking back into Monument Valley, Utah. I can classify my road trips into three general types. The first is an almost inconsequential road trip, those that are to and from a major city, typically for a class or convention. The main purpose is to get to the destination. I guess you could even put many of my trips to central Florida in this category. These are typically solo trips. Chances are you don't even have to research hotels or make reservations for an overnight stay, unless you have a specific place to stop or a hotel chain you have perks for. If an establishment has no vacancy, there is usually another hotel in the vicinity (seems like hotels in the East cluster together like mushrooms), or there's another hotel 10 miles down the interstate. The East to me is more history of the United States than anything else, it's where the country started, after all. The Revolutionary War, the War of 1812 and the Civil War, major events which shaped this country, mostly happened in the East. Then there are the road trips West of the Mississippi, where populations dwindle and even hotels along the interstate become rare. These are the road trips of choice for me. There are some impressive things between Great Muddy and the foothills of the Rocky Mountains, but the great plains is a flat, featureless expanse of (now) farmland that stretches from Illinois to Colorado, and North Dakota to Texas. The altitude sneaks up on you as you travel from the Mississippi to the Rockies, but once there, the vistas and scenery is amazing until you hit the Pacific Ocean. Most of the West outside of urban areas is empty compared to the forests of the East. If you want to see the preserved geologic history of catastrophic uplifts, volcanoes, and erosion it's to the West. A lot of what's here is geared toward those Western road trips, where you're more on your own for a week or two, and should be prepared for a more unpleasant experience if something goes wrong. But in many ways, a road trip is a road trip, everything here should be considered. These are just things that I've found that make a better experience, and try to keep them in mind when planning a trip. Your time in the car shouldn't be more than 8 hours a day. Okay, I sorta bend that rule for the start of my trips. I've always said my trips really don't start until I'm 500 miles from home (nothing but flat farmland to see, and I've seen most of it), so for the first couple of days I'm usually doing nothing but putting miles between me and home. I will also point out that the more comfortable the car, the more miles you can do at one time. I could only do about 650 miles in a day in my Grand Am, but can do 850 in my Maxima, since it's quieter, and is a more comfortable car. I've spent 15 hours in a car (which is how you do 850 miles), but not on consecutive days, and I was by myself, just making as many miles as possible. I'm not sure how anyone else would appreciate it. You're on vacation after all. So once I actually start my vacation, I try not to do more than 8 hours a day in the car. Usually less. I also try to break up my days into two or three parts, so it doesn't feel like you're in a horse race. There is usually more than enough natural (and unnatural) attractions along your route that can stop at and take an hour or two to break up the time on the road. I cover this more in the planning section. Behind a rest area near Chattanooga, Tennessee. Nick-a-Jack Reservoir (Tennessee River). Oh, you should always plan in enough time to get enough sleep. Planning a night as an eight hour stop isn't enough time. You should probably plan for at least 10 hours a night at a minimum. Checking in and checking out, unloading and loading the car, as well as winding down from the day, checking e-mail, backing up your pictures, showers, making coffee in the morning; they all take time. If you plan a trip report of some sort, you should write down your immediate thoughts that night. (I have a voice recorder I've taken audio notes on, as well as occasional video/audio notes on my camcorder, but I do type in notes every night on my laptop. So if you allocate 10 hours at a minimum for an overnight stay, you'll still be short on sleep. However, consider the next topic. Stay at the place you're going to visit. This is why Scenic View rooms are worth it. 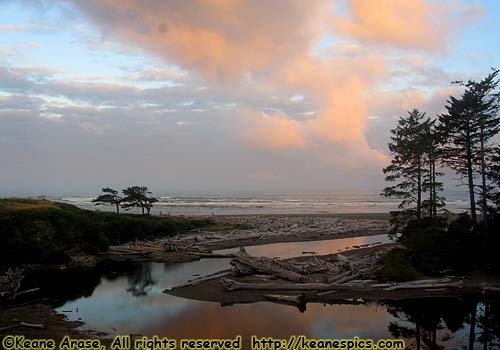 Taken from our room at Kalaloch Lodge, Olympic NP. All of my Western (and some Eastern) trips have been to National Parks. Most of the LARGE National Parks (Yellowstone, Grand Teton, Glacier, Grand Canyon, Yosemite and Olympic come to mind) have lodges that date back to when the railroad used to promote the parks. I've come to the conclusion that if you can, your best option is to stay in the park at a park lodge. There are plusses and minuses to this. The plusses are, you're there. Sometimes, you may have to drive 10 or 20 miles just to get from the main part of the park to the nearest town for a bed, and the time is usually better spent finding a spectacular vista to see the sunset. Sometimes (usually an extra cost room) the views out your window are spectacular, and worth every penny paid. The other end of the scale, we stayed at one of the "cabins" at Canyon in Yellowstone. It was remarkably inexpensive. There was a reason for that. The cabins were in a cluster of four, but there was only one adjoining room. But you could almost hear someone breathing in that room. We spoke in hushed voices so our neighbor couldn't hear us. We had a wee creature visit us and sample our baggie of cashews, but either didn't like them or just took one, but we still threw the bag out. Hey! It's nature! One of the negatives, is you are also captive of your host, who in the national parks is usually an outfit like Aramark. Now, I wouldn't have a problem with Aramark if it wasn't for their uniformly mediocre food, no matter what park I seem to go to. On the other hand, places like Goulding's Lodge in Monument Valley was a tremendous place to visit, as are tourist towns like Moab, UT. Which brings us to other places than national parks. I always try to stay at the place I need to be. When I visited Tombstone, I stayed in Tombstone. Same with Disneyland. In Monument Valley, I stayed at Gouldings, if only to bond with the spirit of John Wayne and John Ford. Moab, Utah is a hub between Canyonlands and Arches National Parks, as well as Dead Horse Point State Park and the background to literally dozens, if not hundreds of movies, and is a natural place to stay if you're visiting the area. However, staying inside of National Parks or very popular tourist destinations, you need a reservation, and it sometimes becomes a big puzzle on how to plan your trip. For instance, the closest place to Monument Valley that had a room was in Blanding, Utah, and was my only option for over a month until a room at Gouldings Lodge opened up. (And it was well worth the effort to keep checking. Since then, I believe the Navajo opened a hotel, so things might have improved.) I had the same experience with Grand Canyon that same trip before a room at Maswik opened up. I had wanted a rim hotel, but one never became available. I will cover this in more detail later. Plan a break in the middle of the trip. You'll be living out of a suitcase for the entire trip, and it's nice to not have to check-in to a hotel and lug that suitcase and cooler from the car to the room and back. So plan a slack day or two in the middle of the trip as a vacation from your vacation, or at least stay in the same place as a base camp for a couple of days. If there's a crowd of people stopped along a National Park road, there's wildlife there. And I don't mean the crowd of people, though sometimes you have to wonder. So slow down and watch for stupid people who like to cross roads without looking for traffic. There are also a lot of Europeans in the parks, who may look the wrong way. And please try not to be one of the Incredibly Stupids. 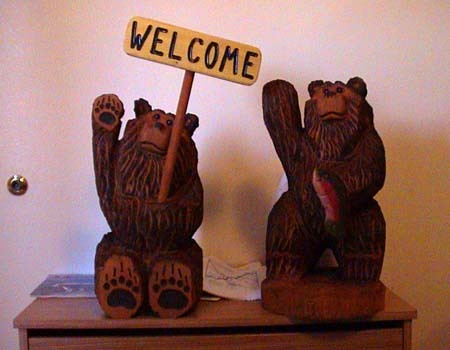 In Grand Teton, traffic came to a stop, because of a couple of bear cubs. The Incredibly Stupid person decided that traffic wasn't going to move, and because of no pull off areas, he shut off the car and locked it IN THE MIDDLE OF THE ROAD and took off to see the bears. Traffic starts moving, but only in one direction because our lane of traffic can't get around Incredibly Stupid's car. If this wasn't a legitimate reason for road rage, I've never seen one. Be aware that there can be wildlife in the middle of any road, anywhere, anytime. The chances of this occurring in a Western National or State park is about 99% higher, so be mindful of your speed in areas of short or low visibility. If you're in a slow moving vehicle on a single lane highway and there are 30 cars stacked up behind you, pull over and let them pass. They will thank you for it. Or at least, will stop cursing at you. If I'm taking a leisurely drive down a National Park road, I at least do the speed limit, but will still pull over so the guys in a hurry can pass. Here's a harsh one. The National Parks are not Disney Parks. Mother Nature will kill you in an instant without any remorse or regret. You are always responsible for your actions. Don't be stupid. Think about what you're doing, and what the people or children you're with are doing. Wet rock and loose rock are slippery. If you live at sea level, things are much more difficult above 8,000 feet due to the lower levels of oxygen available. Chasing those cubs for a picture is probably a tremendously stupid idea, since Mom's around someplace, and she's very protective. You can drive when you're tired, but don't drive if you're sleepy. In most states, you can stop at a rest area for a few hours. 20 minutes of sleep then getting out and stretching can do a whole lot to keeping you awake. If you're completely unfamiliar with a park, stop at the visitors center. Tell the Rangers how much time you have, and they can probably recommend the best thing to do with that time. And make sure you get a park map and newspaper. They're your best (immediate) resources to get you around and inform you of what's going on, like construction, special events, etc. Do the speed limit near state lines. I won't go any further except to say I've seen more state troopers on backroads a couple miles before the state line (as you're leaving the state) than I have in the whole of Montana. Most of all, have fun! See America! End How I Plan A Road Trip - General Rules of Thumb.